As Team Trump Lawyers Up, Who's Paying The Attorney Fees? President Trump's re-election campaign paid Donald Trump Jr.'s lawyer $50,000. White House lawyers are paid government salaries, by taxpayers, but it's unknown how the private lawyers are being paid. President Trump attends a January press conference at Trump Tower with children Ivanka and Donald Jr., who is the latest member of the Trump team to hire a lawyer. The latest Trump associate to hire a lawyer is Donald Trump Jr. Based on his own emails and interviews, he eagerly attended a meeting in 2016 with Natalia Veselnitskaya, a Russian lawyer who he believed had opposition research on Democratic presidential candidate Hillary Clinton. Trump spoke up for his son in Paris last week. "I have a son who's a great young man," the president said. "He's a fine person. He took a meeting with a lawyer from Russia. It lasted a very short period. And nothing came of the meeting." 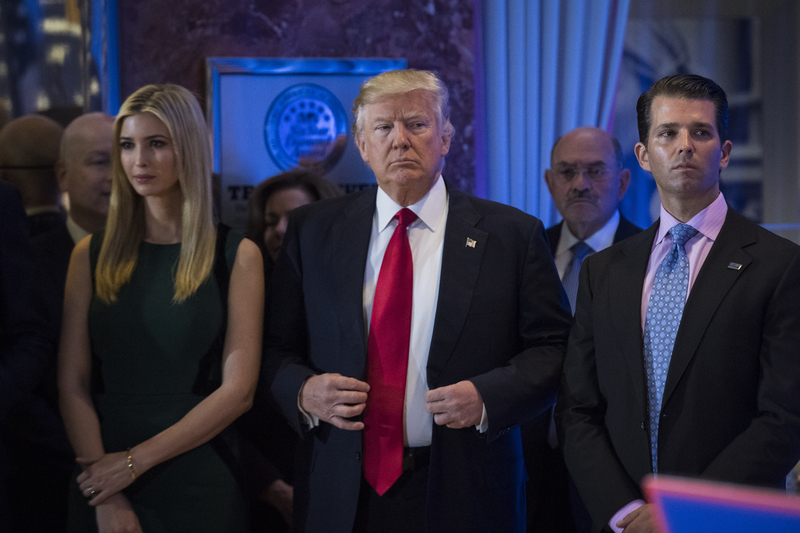 Given Trump's wealth, it might seem logical that he would cover his son's legal bills. Trump often bragged about his money during the campaign. "I don't need anybody's money; it's nice," he said as he announced his candidacy in June 2015. "I don't need anybody's money. I'm using my own money. I'm not using the lobbyists'. I'm not using donors'. I don't care. I'm really rich." But last month, it was Trump's 2020 re-election campaign committee that paid $50,000 to the firm of his son's New York lawyer, Alan Futerfas. So far this year, the campaign has raised about 75 percent of its contributions from small donors — those who gave $200 or less. "It's legal for the campaign to pay any legal expenses arising out of the campaign," said Larry Noble, general counsel of the Campaign Legal Center, a watchdog group. "What's interesting here is that the payment was made prior to any public disclosure of the emails from Donald Trump Jr." — the emails that earlier this month revealed the previously secret meeting. Also this month, President Trump hired another lawyer for the White House counsel's office, which represents Trump in his official capacity as president. Press secretary Sean Spicer explained it this way at Monday's press briefing: "It was the decision of the White House to bring someone on board, that like in a lot of other areas that we have counsels dedicated to that, that there was significant interest in the subject to do that." Other presidents have brought lawyers into the White House counsel's office to handle those explosive issues — Richard Nixon, who resigned to avoid impeachment in 1974, and Bill Clinton, who was impeached by the House of Representatives in 1998 but acquitted by the Senate. This kind of legal representation doesn't come cheap. When Hillary Clinton ran for Senate in 2000, as her husband was winding down his presidency, her personal financial disclosure showed they owed lawyers somewhere between $2.3 million and $10.6 million. Disclosures in later years indicated the Clintons paid up. The costs of hiring a lawyer could loom over the next set of potential clients: White House staffers who get caught in an investigation or merely touched by one. They are not represented by the White House counsel's office. Political scientist Nancy Kassop of the State University of New York at New Paltz, a co-author of a report on the White House counsel's office prepared for the presidential transition, said, "During the Clinton process, I know that there was great consternation when White House staff members were told that they had to provide for their own legal representation."